the theme of your entrance. Are you looking for the perfect staircase for your home? What features and designs are you looking for? If you still have not found the right one for your home or office, then Ackworth House is the staircase manufacturer to call. Our range of architectural stairs demonstrate our excellent workmanship and show that we supply the latest in stair designs. 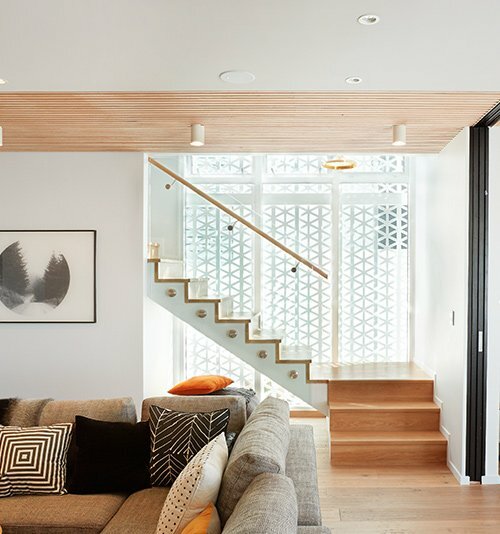 Since our company began, we have built a reputation as the trusted staircase and balustrade manufacturers, serving architects, builders, and homeowners in Whangarei, Auckland and the rest of New Zealand. In addition to our impressive 40-year track record in the business, there are many reasons to make us your stair builder of choice. Click the video below to view one of our recently completed projects. We are pleased to offer a broad variety of stair designs for residential clients. Our Ascendo design collection combines sleek and modern aesthetics with practical function. Not only are the staircases designed to enhance your space visually, but they are also manufactured to the highest standards and stringent building specifications. 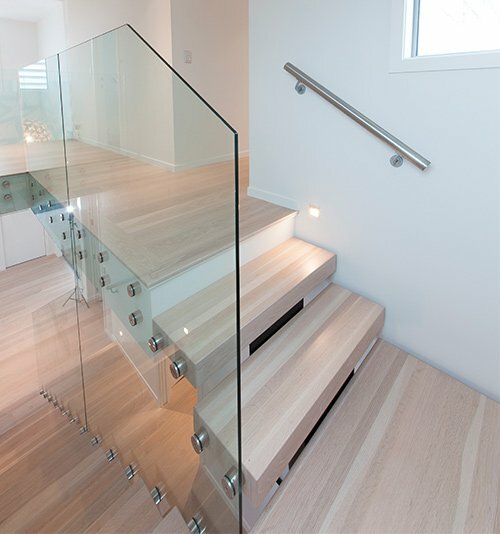 For homeowners, we will manage the manufacture and installation of all the components of your stairwell, including stringers, treads, handrails and balustrades. The elegance and space-maximising features of Ascendo stairs, together with their low-maintenance design, make them an ideal addition to commercial establishments. In commercial applications, we provide non-slip and/or contrast nosing on the tread. We achieve this with stainless strips set 2mm above the tread with a contrasting timber in between. 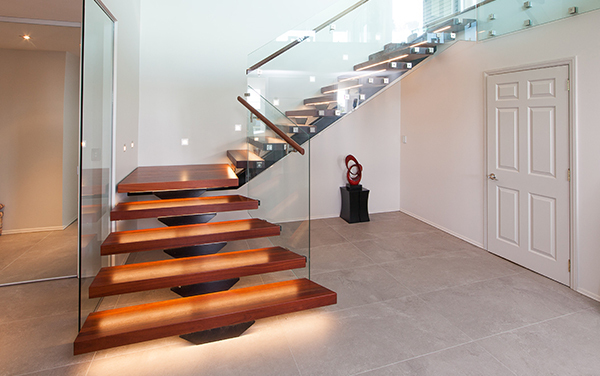 As NZ’s trusted staircase builder, you can be assured that our commercial stairs have all been designed and engineered to meet stringent NZ regulations. If no design in our portfolio meets your vision or requirements, we can make a custom design uniquely for you. We work with you throughout the design, construction and installation process to ensure that you’re satisfied with the results. Whatever ideas you have in mind, we can turn your vision into a reality. Feel free to view some of the custom projects we’ve done for our clients. As one of the architectural stair specialists in the country, Ackworth House is pleased to offer a wide array of stair designs that seamlessly fit with your design. 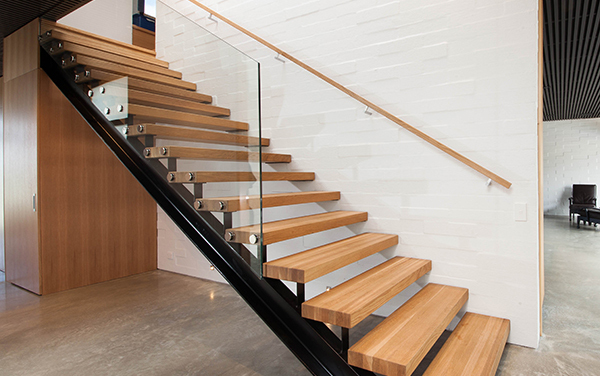 We believe that the architecture of your stairs should be cohesive with your existing interiors. Our Ascendo floating staircases are especially popular with those wanting to build a new modern home or homeowners who want to modernise their existing living spaces. 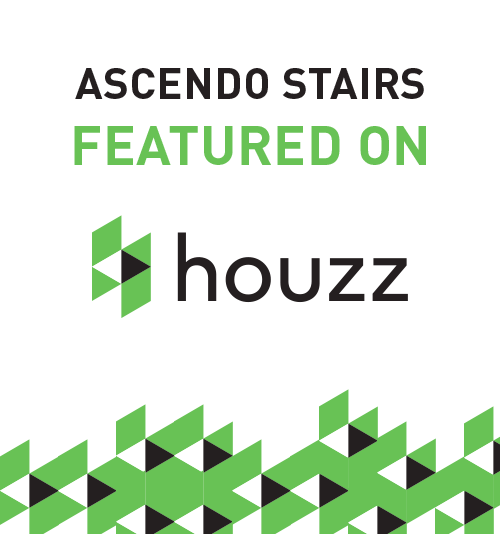 The Ascendo line of staircases has a variety of designs which showcase great architecture while balancing modern aesthetics and without sacrificing function. On top of it all, we make sure to abide by New Zealand's building regulations when designing and engineering staircases. You can rest assured that our stairs are architecturally sound for you and your family’s safety. 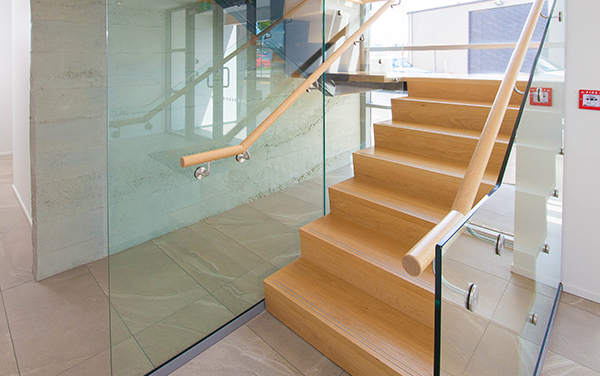 Alongside an extensive selection of treads, balustrades and handrails, our range of modern stair designs includes a variety of options, and property owners are sure to find one that suits them. From floating to timber to steel to custom staircases, our team can bring to life your dream stairwell. We offer stairs to homeowners, architects and builders in Whangarei, Auckland, Hamilton, Tauranga, Wellington, Nelson, Christchurch and anywhere in between. Browse through our website to see more of our designer staircases. 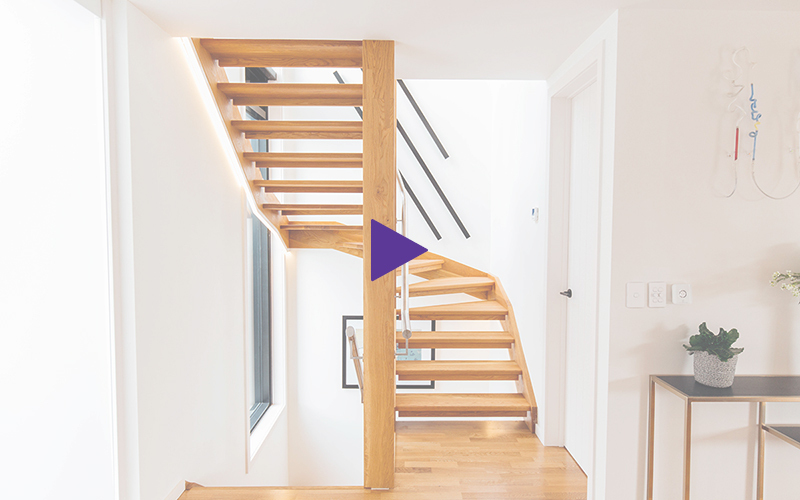 For over 40 years, Ackworth House has been providing New Zealanders with beautiful yet practical staircases for their building needs. If you have had Ascendo Stairs or any of our other designs installed in your space and have a testimonial you would like to share with us, email it here. We have had both architectural & carpet grade stairs made by Ackworth House and have been very happy with the quality of the workmanship. Ackworth House has been a great company to work with, providing excellent service throughout the project and finishing jobs on time. We wanted to thank Kyle Simpkin for guiding us through our renovation and his assistance with the design, construction and installation of our stairs and balustrade for our balcony. We have been in our new home for a year now and are delighted with the result. The quality of Ackworth’s work and attention to detail is exceptional and we appreciate the input from Kyle in helping us to achieve the final product - a home we love. We have dealt with Lincoln and his staff for many years. Ackworth House supplied and installed a beautiful solid timber staircase for us and made the whole process very straight forward. Lincoln as always was very easy to deal with and provided an excellent service. A big thank you to Lincoln and his team. We chose a standard stair design from Ackworth House and then adapted it to meet our particular requirements for our new home. We wanted the stairs to be a key feature of the house and Ackworth met our expectations in every respect. We were delighted with the result and found Ackworth and its sub-contractors helpful and professional to deal with. We have no hesitation in recommending Ackworth House. I have been impressed with every step of the architectural staircase design and installation process. Kyle and his team have successfully listened to our ideas, enhanced them and have brought them to reality in our challenging renovation project. These guys actually deliver on the Ackworth House/Ascendo vision. Willingness, Quality, Punctuality, Honesty. Well done Ackworth team! Great communication, very pleasant people and a very successful outcome. I recommend them for your project.